Rome Video Travel Guide with info, photos and professionally made high quality video of major sights in Rome like: Colosseum, Pantheon, Forum Romanum, Trevi Fountain, The Spanish Steps, Piazza Navona, Villa Borghese, St. Peter's Square, the Vatican Museums and many, many more. The App contains almost 200 high quality photos and over 30 minutes of high definition video. Our aim is to show you the most beautiful and interesting places that Rome has to offer. We are a completely independent publisher with no connections to official tourism offices of Rome or Italy, nor have we any relationship to travel agencies. For 8 locations you can see an interactive full spherical (360°) panorama. They allow you to explore a location in all directions, as if you're already on the spot. The exclusive video documentaries in the App are filmed in high definition and edited by our own professional video editors who recently visited Rome. 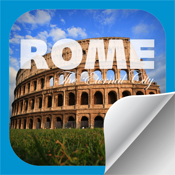 Watch the videos in this App to better prepare your trip to Rome. The video clips have a pristine quality. The App contains a detailed street map of Rome's centre, a detailed map of Rome’s underground and rail and online street and satellite map. For each sight, a detailed location map with streetnames is provided. Extremely detailed satellite images with birdeye view are also provided, but these require an Internet connection. The App also contains an interactive floor plan of St. Peter's Basilica and an interactive overview of the Forum Romanum.